Bond Hilton Jewellers - Our main website, authorised stockists of Carrs silver of Sheffield, Broadway Silver, Hermle, Lepee Clocks, Matthew Norman, Swiza, Rapport, Rowallan and Woodford. 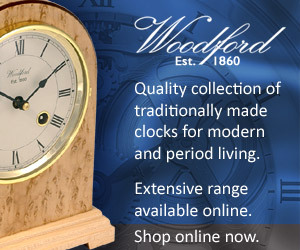 Woodford Clocks - Established In 1860, Woodford manufacture fine pocket watches and carriage clocks. Cutlery UK - Sterling silver, silver plated and stainless steel cutlery. Photo Frames UK - Hallmarked sterling silver photo frames and silver plated photo frames by Carrs Silver of Sheffield. Bond Hilton Clocks - Specialist Comitti London, Matthew Norman and Swiza clocks website. We all have in stock, Jewellery Boxes UK - Finest jewellery boxes from Carrs, Rowallan and Woodford. Visit us today from this page for all the latest and finest watches and carriage clocks at Bond Hilton. View our website here!